Assembling around 6PM in stores, a mixed crew of innocent young freshers and experienced cavers attempted to collect their gear in reasonable time. Despite valiant efforts, we didn't get off till 7:30. The journey was quite reasonable however, and after a speedy night shop we had arrived at our hut by 12. After a quick supper of spaghetti in true student fashion we slid into our sleeping bags to enjoy a pleasant nights serenade of snoring. We mostly awoke quite early, eager to set out caving. Stragglers were enticed out of bed by cups of hot tea and the smell of a hearty breakfast. Our bellies full, we piled into the minibus and began the drive to OFD. My memory of our actual route is poor to non-existant, so I shall report it mainly with names of the formations we passed, possibly even in the correct order. We began by heading towards Judge and Trident, but peeled off early. On our travels we passed the Frozen River and saw numerous stalactite formations. This route brought us through some rather tight squeezes which I was very glad not to be carrying a tackle sack through. In the process of moving between these there were plenty of chances for free climbing and traversals, which I enjoyed particularly. Following the river down to Trident and Judge brought us to the turning point in the trip, as we began to head out. On our way we had another chance to get our feet wet after I choose the muddy path to the Mini Columns, a descision that may be considered unwise in retrospect. Following a quick break there we returned to the entrance by a rather dodgy (read: intensely enjoyable) free climb down several false ledges. 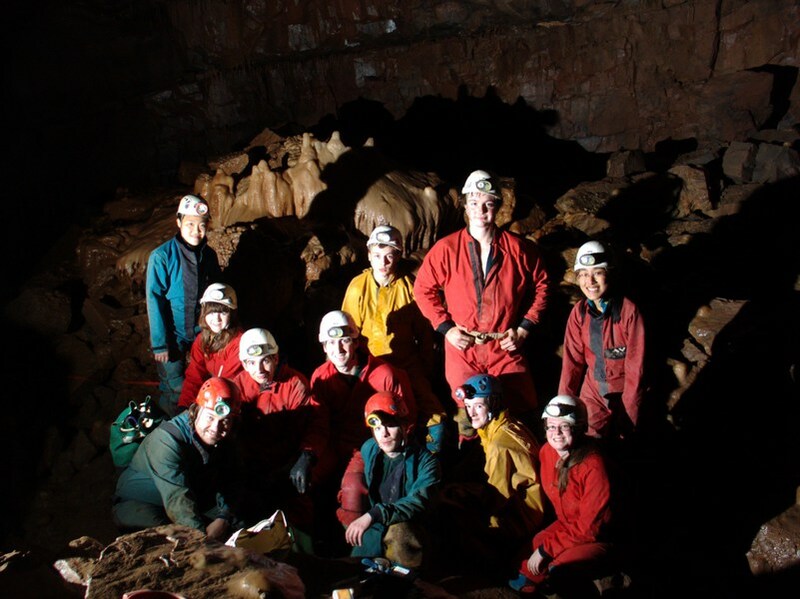 All in all, a round trip of 5-6 hours and an excellent crash course in caving. This being my first real experience of caving, I found the size and variety of OFD quite surprising. I'm not quite sure what I was expecting, but the cave did not disappoint. Upon returning to the hut, we quickly got stuck into producing a good solid meal. This was a very successful experiment of Jarv's: home made pizzas. It turned into a real group effort, with bases delivered to an expert assembly line outside before returning to the kitchen for cooking. There was so much dough that we had fresh food supplied for much of the evening. After taking our fill of dinner there was a chance to see the infamous caving games that I had heard so much about. The squeeze machine proved popular with us new people, but the many more experienced of the group chose, perhaps wisely, to spectate. Somewhat tired from the day before, we rose at more civilised hours on Sunday. After an even more substantial breakfast, we again split into three groups. Nico, Clare, Sabre and John choose to remain at the hut, while Alex led a group on a relaxed tour of some smaller caves about the Little Neath river. Jarv and William led Sally, Sam and I down Little Neath cave. Crawling down the river entrance was pretty tight, but with my wetsuit on I was nowhere near as cold as I had expected. In front, William led at a blazing pace, setting an enjoyable test for us freshers. We took a break at the bottom of the cave before retracing our footsteps briefly and heading into the Canal. The roof quickly fell and the water deepened, but this section proved easier than walking as we could drag ourselves along, half floating in the stream. Seeing foam on the roof from last time the cave flooded was slightly unnerving. Reaching the rescue dump at the Canal's end, we started back towards the exit. In no time we found ourselves back at the entrance tunnel. Just after entering the tight section we suffered two lighting related grievences. First William discovered his irreplacable battery box lid was missing, which we could not find, and shortly after my own batteries died. Fortunately changing them did not prove too difficult despite the restrictive walls. Upon leaving the cave with no fatalities we returned to the bus and paid due reverence to the stash of food left there. Back at the hut we were presented with yet more food, in the form of spaghetti and mushroom sauce, prepared by those who stayed behind. After dining we got away quite quickly, leaving the hut around 6:30 and reaching stores at 11.